OSv is the versatile modular unikernel designed to run unmodified Linux applications securely on micro-VMs in the cloud. Built from the ground up for effortless deployment and management of micro-services and serverless apps, with superior performance. Try it out on your existing cloud account. Download and run on your local system. 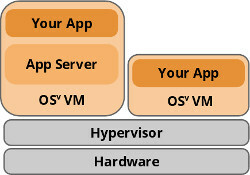 OSv reduces the memory and cpu overhead imposed by a traditional OS. Scheduling is lightweight, the application and the kernel cooperate, and memory pools are shared. OSv provides unparalleled short latencies and constant predictable performance, which translates directly to capex savings by reducing the size and number of OS instances. OSv gives you low overhead and rapid turnaround, like containers, but with the deployment flexiblity you only get from true virtualization. With the Capstan build tool, you can build and run with one command, but create a complete virtual machine that will run on your existing cloud environment. Creating a VM image adds only 6-7MB of overhead, three seconds of build time, and a few lines of configuration. Learn more about Capstan. Legacy UNIX-style configuration files are gone, replaced with a simple, consistent REST API and consistent deployment, based on cloud-init, that works the same across public and private clouds. OSv instances can be deployed directly from a developer IDE or through your continuous integration system, either within the enterprise or to the cloud. It’s as fast and convenient as a PaaS system, but everything is deployed as a first-class virtual machine directly to your cloud of choice. Learn more about enabling devops. OSv supports many managed language runtimes including unmodified JVM, Python 2 and 3, Node.JS, Ruby, Erlang as well as languages compiling directly to native machine code like Golang and Rust. Usually OSv runs unmodified applications. In order to provide even better performance, it’s possible to access a low level kernel api. An application has access to the block device and flushing, and can map the NIC descriptors directly (virtio-app) and signal the hypervisor. We believe that the number of cycles the application requires should always be smaller than the kernel path. OSv makes all management interfaces, from low-level OS tuning to the application’s management endpoints, available through a discoverable REST API. An optional in-browser interface makes full-stack development and deployment hassle-free. Learn more….